Hyper-threading Pentium4 and Bluetooth / No. 55 PCSTATS Newsletter PCSTATS - PC Hardware Reviews and Guides - Get The 'Stats and Stay Informed! The Weekly PCSTATS Newsletter is free to subscribe to, and chocked full of the latest hardware reviews, tech tips and other tasty tid-bits. Sign up and try it out today, or search the PCSTATS Newsletter Archives for past issues. Chris has brought back word from the annual IDF where one of the highlights was a 4.1GHz Pentium 4 processor demo. I won't spoil the rest of this week's High Tech Low Down for you, but it seems as though the processor wars are about to go into overtime! This week begins with a Bluetooth enabled motherboard from Epox which garnered an Award from us. The 8K5A2+ carries on in the tradition of the highly touted 8K3A+ so this review is a must read. To make sure you have memory fast enough for the Epox, we also took some PC2700 DDR333 from Twinmos for a spin and saw some really impeccable results. Since we're always interested in the newest and coolest technologies, we recently tested out a few sets of wireless 802.11b networking gear. Wireless networking is very trendy because you don't need wires, but we found that some products can be pretty difficult to configure with basic security like WEP. Epox has the reputation of producing well built & fast motherboards that overclock very well. This was evident with the Epox 8KHA+ and 8K3A+ (which we loved), and now Epox has released another motherboard based on the VIA KT333 chipset. To be honest we were a bit surprised by this move. After all, the 8K3A+ was and still is very popular among AMD users. Why not release a motherboard based on the VIA KT400 or SiS746 chipsets instead? Price Comparisons: Looking for a little Bluetooth or Serial ATA on your next motherboard? When DDR first came out, TwinMOS was also one of the first companies to not just offer DDR memory, but DDR333 compatible modules! I know this because we reviewed a stick of it back in July of 2001! No we're not looking at the same stick of RAM, with the recent JEDEC approval of the DDR333/PC2700 memory frequency standard TwinMOS can now officially label their memory DDR333/PC2700. So what's the big deal Colin? You've played with a ton of memory in the last little while, what does TwinMOS have to offer?" I have always searched for the "perfect" memory module, the one that will bring me to a new high in terms of performance but so far this magical stick of RAM has eluded me. Will the TwinMOS PC2700 be my saviour? Wireless LAN's are gaining in popularity with a speed that is eclipsing the rate at which Ethernet's were originally adopted by home users. Now, with wireless coming into the spotlight we are faced with multiple choices, features, and useability. The 2.4GHz 802.11b standard is even being challenged by 802.11a and the upcoming 802.11g which will bring more bandwidth to the table. The real question right now for users accustomed to simple-to-setup Broadband connections is whether or not the cost of going wireless is justifiable. That justification comes in several ways; connection speeds, freedom from wires, and setup. In reality, things are not always ideal, and then there are the security issues. Unlike a wired network, a wireless LAN, or WLAN transmits your data (personal, public, or whatever) through unlicensed airwaves that anyone within range can potentially intercept. There are ways to safeguard that data - and the first such step is enabling 64-bit or 128-bit Wired Equivalent Protocol (WEP). It's nice to see that manufacturers are quickly adopting the SiS 648 chipset as an alternative to Intel's i845D/E/G DDR chipsets. Competition is good, and this will only drive prices down further. We were rather impressed by the overall "stock" performance of our first SiS 648 motherboard, the MSI 648 MAX but it was not for really built for enthusiasts. You've seen them in your friends computers, on half a dozen websites, and now you're checking them out here. 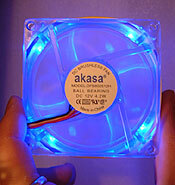 They are the infectiously popular LED impregnated glowing fans that I swore to myself I would never "review." There are two types; the first with four blue LED's and the second with multicoloured lights of which there is one blue, green, red, and orange LED. Of the two types of fans the all Blue coloured fan looks the best. Today we're going to be dealing with the touchy subject of overclocking. Let's face it, most of the time even the fastest computer is not "fast enough" and that is why people "overclock" computers. Just how do you overclock a CPU? There are two simple ways; you can raise the clock multiplier and/or raise the bus speed. Multiply the clock multiplier (inside the CPU) with the bus speed and that gives you the CPU speed. Here's an example... A Pentium 4 1.6 GHz has a multiplier of 16x and the bus of the processor is 100 MHz or 16 x 100 MHz = 1.6 GHz. Since most modern processors are locked by default, raising the multiplier is often not an option. That only leaves overclocking via FSB adjustments. What you want to do is go into the BIOS and find your way to the "Frequency Control" section if it is supported (not all computes have this). There you should see either "Bus Speed" or "FSB" written. It's most likely set at 66 MHz, 100 MHz or 133 MHz. What you want to do is raise it a bit. For instance if you're running a Pentium 4 1.6A Northwood, upping the FSB to 133 MHz will makes your processor run at 2.13 GHz. If you find that your computer is less stable at these higher speeds, you may want to up the voltage a bit. Setting higher voltages stabilizes things because the signals are now stronger. To be safe, if you're a novice overclocker don't raise voltages past 10%. Upping the voltage and running faster usually means higher temperatures. For modern processors you don't really want to be running pass 60 degrees Celsius so if you're above that mark, slow down the computer until you get better cooling. Since programs usually benefit from higher clock speeds, having a processor run faster is usually beneficial. However running components beyond their rated specifications voids warranties . So you have to be careful. If your computer is a bit old and you want to make it run a bit faster, perhaps overclocking is your answer. Colin's Tech Tips have been archived for your reading enjoyment! Who did you see that thread in the PCStats Forums today? Sign up, join in, and get the discussions going! The Intel Developer Forum kicked off earlier this week and was highlighted by a Pentium 4 demonstration running at 4.1GHz. The testers increased the processor's clock speed dynamically, eventually hitting 4.7GHz before the processor crashed (keep in mind that the Pentium 4 in question was being super-cooled). Intel's President, Paul Otellini, confirmed that the upcoming Pentium 4 3.06GHz chip will support hyper-threading and claimed servers will see about 30% increased performance with the feature enabled. Even more exciting, desktop applications will see up to a 25 percent boost. And, the feature should be easy to implement with a motherboard BIOS update. Windows XP already recognizes hyper-threading, so it would seem that the last step is for Intel to enable the feature. Get ready for some Athlon XP 2400+ and KT400 reviews from PCstats.com next week. Also coming up is a look at two brand new TFT displays that might make you decide to switch from CRT! More tips, and tweaks from the Colin, and lots more! PCstats News is updated throughout the day - right here. Copyright 2002 PCstats.com Newsletter, all rights reserved. Any reproduction, in whole or in part is prohibited without express written permission.